My beautiful Grandma Mimi passed away last Monday. I detailed some of my favorite memories of her in this post -- and mentioned how much I appreciate our shared love of beauty. My grandma always, ALWAYS had her nails done -- and they were usually a beautiful shade of pale pink. I decided to honor her memory with a pale pink manicure of my own, and I chose Essie Just Stitched. 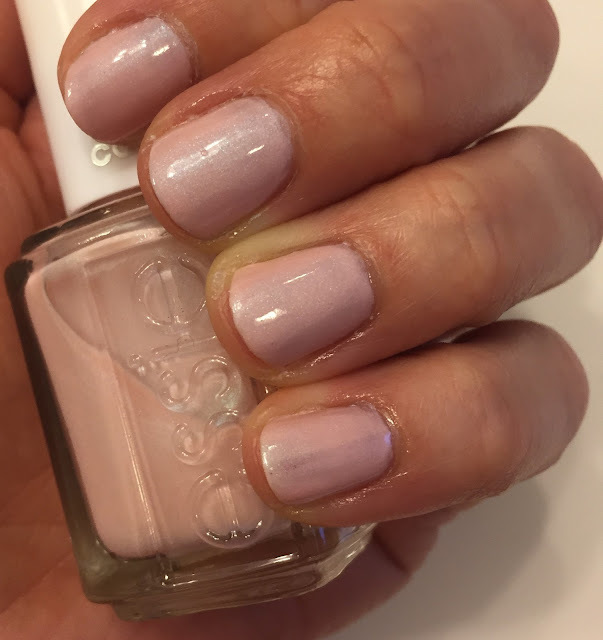 Essie Just Stitched is originally from the Cashmere Matte Collection that was launched in 2015. The Cashmere Matte shades were actually among some of my favorites that Essie ever created! I am typically not a matte nail polish fan -- I like it glossy, glossy, GLOSSY. But these shades were just so, so perfect. Like Comfy in Cashmere, for example -- I mean, look at that shimmery purple! I love the addition of the shimmer in this pale pink polish. But I'm here to talk about Just Stitched today. Just Stitched is a beautiful pale pink shot through with turquoise shimmer. Two coats yield even, perfect, opaque color. As you can see, I didn't leave it matte -- while it looks nice that way, I preferred it glossy with top coat. But it can definitely be worn either way. This is one of those colors that's very ladies who lunch but with a twist. I'm typically not really a pale pink nail polish fan, but the addition of the turquoise shimmer kicks it up a notch and gives it that je ne sais quoi element. Essie definitely knocked it out of the park with this one. I think my grandma would have loved this color. I hope that I've done her memory proud by wearing it for her. Essie Just Stitched retails for $8.50 at beauty.com. I'm so sorry to hear about your Grandmother. I'm sure she would of loved this shade too, it's very soft and beautiful. Thank you so much. I hope she would have loved it as much as I do. I'm so sorry about your grandma. This is a perfect, demure shade. Thanks so much, Courtney. And I agree -- demure is the perfect word to describe it! This is such a classic shade that will never go out of style, and perfect for work. Your grandma would definitely have loved it. Hugs! Yes, isn't it? Thank you so much, Renu. Thank you so much, Allison. I really appreciate your kind words. It's definitely tough to lose a grandparent. Very pretty shade. My mom didn't like the crazy colors I wear but she'd have approved of Just Stitched so I'm sure your grandmother would too. I'm so sorry to hear about your grandma, so sad. I have this polish and it took me nearly four coats to get an even play on it. It was super duper pretty, just so many coats. I'm so sorry for your loss. <3 I have this whole collection and I still haven't used it yet. I need to get on that. I'm so sorry for your loss, Jamie. It's so hard to lose a grandparent to whom you are so close. Cherish your memories and keep her close in your heart. <3 That lovely, delicate pink shimmer is a very fitting choice, I think. Sorry to read of the loss of your grandma. Love this shade of pink, sending hugs your way! I'm so sorry to hear about your grandma. It's never easy. Not the best segue, but this shade is soo pretty. My heart breaks for you, Jamie! You are in my thoughts!